CHICAGO, ILL. TORONTO, ONT. ATLANTA, GA.
GENERAL INDEX - - - Place pg. # later. The world is flooded with fictitious reading of all grades. The unreal is presented in the most fascinating style, while too often the living truths taken from God’s Word are presented in a heavy somber style. The Bible is the most interesting of all books. It is adapted to every mind. In the Story of Daniel the Prophet, a few of the interesting facts in regard to God’s dealings with his people have been gathered into a simple narrative. The book is the result of much prayerful study. 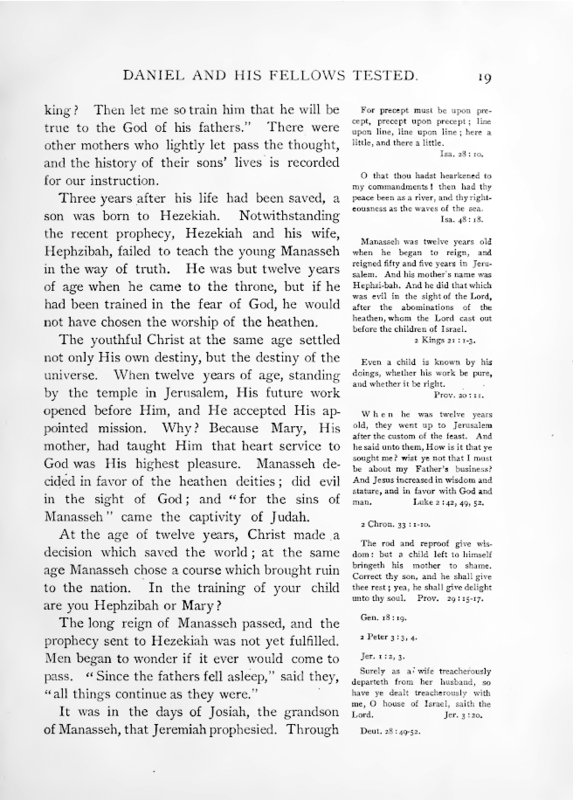 It is sent forth with an earnest prayer, that in the hands of the parents it may be the means of making the study of the Bible in the family a blessing to young and old; and that the teacher in the schoolroom may see precious rays of light flashing from its pages, pointing both teacher and pupil to the Great Divine Teacher. God grant that as it falls into the hands of the careless and unbelieving, they may be influenced to read, and as they read, may behold the beauty of our God, and be led to worship toward his holy temple. We trust that while its simplicity will attract many who might not be inclined to read a deep argumentative treatise, the most studious will find food for thought, and thus become better acquainted with the character of our Heavenly Father. Those who wish to enter into a more comprehensive study, will find that the marginal references open up many veins of precious ore in the deep mines of God’s Word. We earnestly pray that even the skeptic may not cast it aside; but that he may give it a careful reading, and while tracing the fulfilled prophecy in the history of the world, learn to prize the Word of God. Throughout the entire book the special providence of God over those who are faithful to him is brought out in clear contrast to the fate of those who ignore his guiding hand. The truth is the same, whether in the history of nations or individuals. As the Story of Daniel the Prophet goes forth on its mission of love for the Great Master, may it prove a blessing to all classes, young and old, rich and poor, learned and unlearned. The prophecies of the Bible are like rare diamonds lying hidden in the solitude of the mine. The practiced eye of the prospector discovers the gems, and intuitively reads their value; and the skillful hand of the lapidary brings out their many faced beauties in all their sparkling glory. Every facet shines like the sun. One can not exhaust a diamond; neither can one exhaust the prophecies. New facets remain to be polished, to add their brilliant reflection to the whole. In the prophecies as many features appear as there are different temperaments that men bring to their study. The prophecy of Daniel is no exception. This book has lessons for all classes. Because the magnitude of the field of his vision is unlimited in extent, it may be studied from points of view which no man can number. The historian feasts upon his records. The chronologist delights in calculating his periods. The lover of the Messiah rejoices in the contemplation of the times and events that led to his first advent, and demonstrated his Messiahship. And the friend of God traces with pleasure the providential movements by which the course of events has been controlled, and men have been put up, and cast down, just according as they have been instruments in God’s hands to carry out his beneficent designs and purposes. and in opposition to the dictates of worldly policy. These principles glow with undimmed luster through all his career, and have encouraged, comforted, and strengthened the servants of God in all ages. Much has been written on the book of Daniel, and much more might be written, as long as principles of divine truth, and noble examples of adherence to them, form interesting and profitable themes of study. In the present work, lessons from this latter source have been especially drawn out. These will be found wonderful subjects for study, and many remarkable thoughts are presented on these points in the following pages. These are lessons which can be laid to heart with the most satisfactory and lasting profit. One who desires to master the philosophy of an acceptable Christian life, and the means and methods by which a close connection with God may be maintained, can find no more competent textbook than is furnished in the record of the experiences of the prophet Daniel. Do you wish to acquire a vivid sense of God’s care for his people, and his constant remembrance of them, and the easy means he makes use of to accomplish his ends, you will find the subject fully exploited in the prophecy of Daniel. Example is a powerful factor in the promotion of the Christian life. “Be ye followers of me,” says Paul, “even as I also am of Christ.” 1 Cor. 11:1. He exhorts Timothy to be an “example of the believers.” 1 Tim. 4:12. What higher standard can be raised to attain unto, than is shown in Daniel’s relation to God? for it is said of him that he was a “man greatly beloved.” Such was the emphatic testimony borne from God by the angel Gabriel to Daniel, coming as he did immediately from the court of heaven and the presence of God. uncertainty in his mind in regard to the truth on which he was perplexed. Will anyone now raise the query, Does the Lord hear prayer? Is he attentive to the wants of his people? In view of this narrative, how can we harbor the least vestige of doubt? No sooner does Daniel’s prayer begin to ascend to the throne than instruction comes forth from God to Gabriel, to go down to the earth and complete his mission to the prophet. With alacrity he obeys. And the prophet says of him, “Being caused to fly swiftly.” From the beginning of Daniel’s prayer, as recorded in Daniel 9, to that point in the prayer when Gabriel appeared upon the scene (verse 20), could not have been over three minutes and a half, at the ordinary rate of speech. In this brief space of time the prophet’s prayer ascended to heaven, it was heard, decision made, and the answer came. There is no loitering in heaven. The first faint whisper of want by the child of God, is instantly lodged upon the throne. The command to answer is given, and the return messenger is at once by the side of the prophet, with the response of comfort and joy. No earthly “rapid transit” can equal this. What a glimpse does this give us into the inner courts of the heavenly world! What a view of the divine telegraphy there employed, and waiting at the court’s command! What assurance, encouragement, and comfort must these great facts impart to every true and trusting servant in the vineyard of the Lord! describe it as the head of gold on the world’s great representative image. Daniel 2. The Lord by the prophet has called Babylon “the glory of kingdoms, the beauty of the Chaldees’ excellency.” Isa. 13:19. In that city there were beauty, glory, and excellency combined in most striking and prolific forms. Imagine a space (we must imagine it; for no such spot existed before, and has not existed since); —imagine this space containing 225 square miles, situated in a fertile plain, wrought up by expert cultivation to the superb production of ornamental trees and shrubs, fragrant flowers, and substantial fruits, till the whole became a veritable paradise, as the garden of the Lord; imagine this space laid out in a perfect square, watered by the magnificent Euphrates, and surrounded by a wall eighty-seven feet thick and three hundred and fifty feet high, fifteen miles in length on each side, and the great square of the whole area of the city, subdivided into lesser squares by twenty-five streets running from each side of the city, parallel with the opposite walls, and at right angles with each other, and adorned with palaces, porticoes, columns, colonnades, towers, monuments, and hanging gardens, arrayed with everything that art could embellish or money and labor produce, to make a spot pleasant to the sight and touch and every bodily sense. whole, and the spiritual and practical lessons to be drawn from them are hung like banners of light all along the way. The rest repays the weary toil. After his long service and all his trying cares, the word to Daniel was, “Thou shalt rest, and stand in thy lot at the end of the days.” The outcome of the Christian service of the disciples in the latter days is expressed in a similar strain by the apostle John in the Revelation: “Blessed are the dead which die in the Lord from henceforth: yea, saith the Spirit, that they may rest from their labors; and their works do follow them.” Rev. 14:13. To Daniel, “Go thou thy way till the end be: for thou shalt rest, and stand in thy lot at the end of the days.” To John: “Surely I come quickly;” and “my reward is with me, to give every man according as his work shall be.” Rev. 22:20, 12. Rest follows the labor; and the end will come. Then follows the remainder of the promise: “Thou shalt stand in thy lot.” The rest is undisturbed, and the lot is sure. of the people of God, when gloriously redeemed. And in reference to this, Paul utters the following living words: “Eye hath not seen, nor ear heard, neither have entered into the heart of man, the things that God hath prepared for them that love him.” 1 Cor. 2:9. That is, the boldest flight of the imagination, the most intense conception of the unseen glories of the heavenly world, have never formed, and can not form, in the human mind any tangible idea of what God has prepared and has in store for his people. “But God,” the apostle continues, “hath revealed them unto us by his Spirit.” Yes, the Spirit has revealed these things to those who are filled with that Spirit, and have received the Holy Ghost. We are happy to give, by way of introduction, this word of commendation to this book, which has new phases for every earnest and spiritually minded reader; and which never grows old. Battle Creek, Mich., April, 1901. It has been with much prayer, and a deep sense of the importance of the subject, that these pages have been prepared. We are living in the closing scenes of this world’s history. The Lord’s own testimony, in the closing words of the book of Daniel, “Go thou thy way till the end be: for thou shalt rest, and stand in thy lot at the end of the days,” should arrest the attention of all who are interested in preparing for the coming of Christ. Then the manner in which the Saviour himself makes mention of the prophecies of Daniel should not be lightly passed by. He says, “When ye therefore shall see the abomination of desolation, spoken of by Daniel the prophet, stand in the holy place, (whoso readeth, let him understand).” Daniel the prophet is the only one in the Bible to whom the Lord addressed, through the angel Gabriel, the words, “Thou art greatly beloved.” Such words to any living mortal in the flesh are worthy of consideration by the devout. We invite a careful perusal of the contents of this work, with the prayer that the Lord will impress minds by his Holy Spirit. The book is not designed to arouse controversy or awaken discussion upon theories, but to tell the truth as it is in Jesus Christ. From the beginning to the end we have tried to tell the story of the prophet and his writings in a brief, simple style, to create a religious interest in the things of God. To the Bible student we have suggested thoughts, both in the story and by the side references, that will encourage study in the home and in the school.